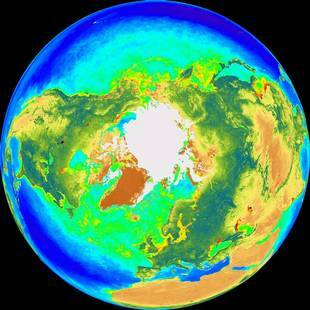 The Global Biosphere as seen from a Polar Orthographic Projection by NASA’s SeaWiFS satellite. The purpose of this “Sea-viewing Wide Field-of-view Sensor” Project is to provide quantitative data on ocean bio-optical properties to the Earth systems science community. Educational information and additional images can be accessed on the website: www.seawifs.gsfc.nasa.gov. Compared to other planets in the solar system, the presence of life is evident from zones of liquid water, green vegetation indicative of a temperate climate, and a variety of landscapes vital for evolution to proceed. Another indicator is a conducive atmosphere of enough oxygen (~20%) for flora and fauna but not too much which would be too combustible. Meyers, Stephen and Alberto Malinverno. Proterozoic Milankovitch Cycles and the History of the Solar System. Proceedings of the National Academy of Sciences. 115/6363, 2018. University of Wisconsin and Columbia University geoscientists expand Earth’s environs to include a dynamic spacescape and temporal depth to its earliest origin. See also Exo-Milankovitch Cycles II: Climates of G-dwarf Planets at arXiv:1805.00283. Alvarez, Walter. A Most Improbable Journey: A Big History of Our Planet and Ourselves. New York: Norton, 2016. In a novel volume, the eminent UC Berkeley geologist joins this popular union of human temporal appearance with a cosmic evolutionary rooting. We log in at the same time as David Christian’s Big History and David Grinspoon’s The Earth in Human Hands. But the three otherwise fine works reflect a tacit mindset, or lack thereof, that this grand cosmos to culture vista yet results from random contingency or chance, a lottery without occasion or destiny, not to occur elsewhere or again. Arenes, Alexandra, et al. Giving Depth to the Surface: An Exercise in the Gaia-Graphy of Critical Zones. Anthropocene Review. Online June, 2018. We note this entry by a landscape planner A. Arenes, the sociologist of science Bruno Latour and geochemist Jerome Gaillardet, as a visual exercise to take in the whole bio-regulated Earth as some manner of solar heated, life bearing, people evolving, preciously fertile abode. Arney, Giada, et al. The Pale Orange Dot: The Spectrum and Habitability of Hazy Archean Earth. Astrobiology. 16/11, 2016. In the thrall of our global collaboration, an astroscientist team from the USA, UK, and France cast back some 2.6 billion years to reconstruct ancient climates, photochemistry, and especially fractal atmospheric hazes and clouds. Whom then is this personsphere progeny arising out of the mists to be able to learn this? As if a late blossom or birth, what does it say about what manner of organic object an Earth might be? Benner, Steven, et al. Planetary Biology. Science. 296/864, 2002. As “a civilization-wide enterprise,” the global expanse of life and its human phase is reconstructed akin to a developing, cognizant organism. Bunyard, Peter, ed. Gaia in Action: Science of the Living Earth. Edinburgh: Floris Books, 1996. Scientific and philosophical papers explore this holistic, ecological hypothesis. The authors look toward the Russian geoscientist Vladimir Vernadsky as its original founder earlier in the 20th century whose theories of the inherent emergence of living matter informs the volume. Crist, Eileen and H. Bruce Rinker, eds. Gaia in Turmoil: Climate Change, Biodepletion, and Earth Ethics in an Age of Crisis. Cambridge: MIT Press, 2010. This hypothesis is not in peril, rather it is the biosphere due to an unchecked onslaught from a consumptive civilization. The usual proponents from James Lovelock himself, still fiesty at ninety, Lynn Margulis, Tyler Volk, Stephan Harding, Timothy Lenton, Connie Barlow, and an array of ecologists and philosophers who weigh in with the latest impressions. The editors introduction is “One Grand Organic Whole.” A salient contribution is “Principles of Gaia Governance” by University of Washington political scientist Karen Litfin. Dauphas, Nicolas. The Isotropic Nature of the Earth’s Accreting Material through Time. Nature. 541/521, 2017. The University of Chicago geophysicist reports new findings about how our home bioplanet formed by gradual additions of moon, and meteorite size masses, which were similar in chemical composition. This work, along with a companion article Ruthenium Isotopic Evidence for an Inner Solar System Origin of the Late Veneer (mantle) in the same issue, merited notice as Earth’s Building Blocks (541/468). Dobretsov, Nikolay, et al, eds. Biosphere Origin and Evolution. New York: Springer, 2008. Guided by the foundational influence of Vladimir Vernadsky, along with their integral proclivity, Russian geoscience tends to the whole biosphere as the proper subject of study. This latest volume from various Institutes of Geophysics, Paleontology, Cytology, Microbiology, and so on, views “living matter” as quite engaged in the achievement of a global “homeostatic” system. The sciences of self-organizing complexity are somewhat mechanically employed to explore life’s hierarchy from a proposed “astrocatalysis” all the way to scientific civilization. Downing, Keith. Exploring Gaia Theory. Mark Bedau, et al, eds. Artificial Life VII. Cambridge: MIT Press, 2001. By means of evolutionary computation and simulation models for a natural selection on a global scale. Dyke, James and Iain Weaver. The Emergence of Environmental Homeostasis in Complex Ecosystems. PLoS Computational Biology. 9/5, 2013. As readers know, James Lovelock’s 1970s Gaia hypothesis of Earth’s viable biosphere as a self-regulated and sustained system due to life’s geological, ecological and atmospheric effects has been under much study since, often attack, but leading to a general affirmation and practical acceptance. Here University of Southampton, Computational Modelling Group, researchers (see web bios below) further quantify and concur that, dare one say, the living planet seems to be actually be taking physiological and anatomical health care of itself. Dyke, James, et al. Towards Understanding how Surface Life can Affect Interior Geological Processes: A Non-equilibrium Thermodynamics Approach. Earth System Dynamics. 2/139, 2011. In this open access journal of the European Geosciences Union, a pithy paper from coauthor Axel Kleidon’s Biospheric Theory and Modelling group at the Max Planck Institute for Biogeochemistry. In such regard, the influences of “biotic activity, geochemical cycling, oceanic crust cycling, mantle convection and temperature gradients” are found to extend deep into the earth’s interior. Life is thus much more than a surface, crustal film, by extension the whole organic sphere becomes as a living entity. Earth System Dynamics is an international scientific journal dedicated to the publication and public discussion of studies that take an interdisciplinary perspective of the functioning of the whole Earth system and global change. The overall behavior of the Earth system is strongly shaped by the interactions among its various component systems, such as the atmosphere, cryosphere, hydrosphere, oceans, pedosphere, lithosphere, and the inner Earth, but also by life and human activity. ESD solicits contributions that investigate these various interactions and the underlying mechanisms, ways how these can be conceptualized, modelled, and quantified, predictions of the overall system behavior to global changes, and the impacts for its habitability, humanity, and future Earth system management by human decision making.